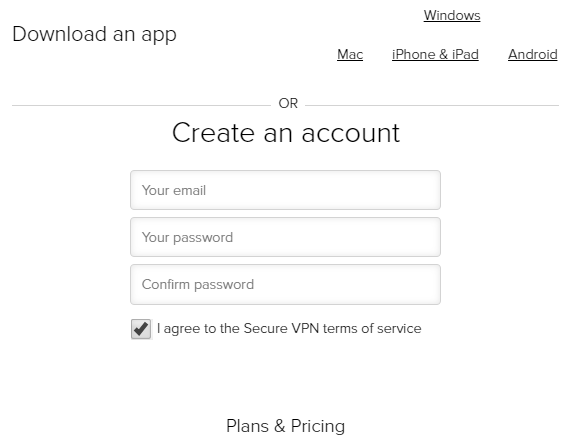 SecureVPN… this VPN service definitely has a few things that sticks out like a sore thumb. From server count, speed, logging and leaks, there’s a lot of things we want to share with you. Secure is a strong word that users love to hear when we talk about VPNs; SecureVPN should fit right in! Now the question is, are they really a Secure VPN to use or is it just another marketing gimmick? Let’s find out! Netflix Test: Works on all servers! Although they only have a small pool of servers to choose from, we’re happy to report that all their servers work well with Netflix! With their unlimited plan, you can enjoy binge-watching all day and night. Unfortunately, their low speeds mean that you won’t have an easy streaming experience despite this fact. To stream without lags, we recommend you check out the top VPNs for Netflix. SecureVPN only has a small pack of servers to choose from, and they all allow torrenting! 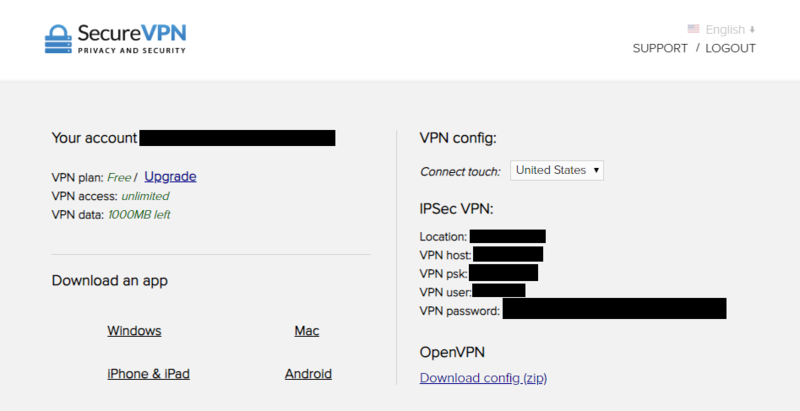 So far, few servers but plenty of functionality – not bad, SecureVPN, not bad. Again, speed is an issue here. Don’t want download speeds at a snail’s pace? Go with a VPN on our top list for torrent-friendly VPNs. If you want information regarding the encryption and protocols that they use, you’d have to ask their customer support because you won’t find anything inside their page except for “military grade encryption” – so AES 256-bit, right? Yes. 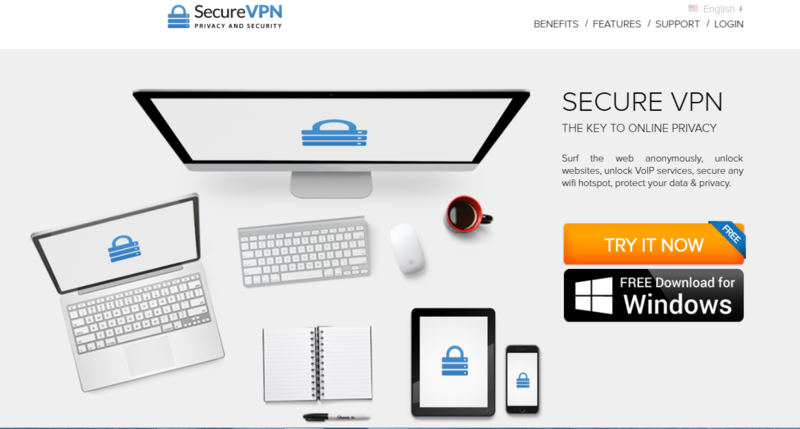 SecureVPN operates on the leading AES 256-bit encryption, along with the top of the line OpenVPN protocol. The good news is they have a built-in kill switch that automatically activates every time you connect to a server. Although you can’t turn it on and off manually, it’s good to know that they at least have this feature built in, so your data won’t be compromised if something goes wrong with your connection. SecureVPN offers a free service that anyone can use, anytime. Since it’s free, it’s also very limited. As in, you can only connect one device and you have a data allocation of 1000MB or a total of 1GB per month. On top of this, they also have a session duration of 20 minutes, which means that you need to reconnect to the server every 20 minutes. This free plan is perfect for non-heavy internet users who only want to use a VPN several times a month to mask their IP address, for example, if they’re searching for something that might be geo-restricted. But if you’re someone looking for a workhorse VPN, and would like to full protection consistently, SecureVPN offer a premium plan that’s either $7.99 per month or you can pay for the year and get a nice discount. 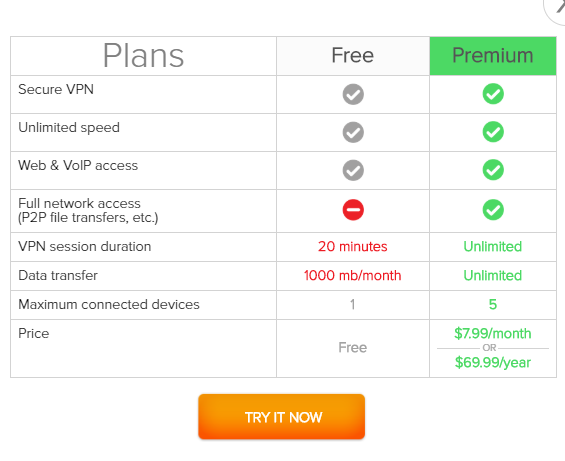 The premium plan is $69.99 a year, or $5.83 per month. Their premium plan comes with unlimited session time and unlimited bandwidth. You can also connect up to five devices, pretty standard for VPNs. Their webpage’s design is pretty simple and is laid out in an infinite scroll format. When you open their site you’ll immediately see the “Try it now” button at the right side of the screen. click on that, and a sign-up box will pop-up on your screen. Simply put your email address and password, and you’re done! It’ll take you to the client area where you can download software suitable for the OS or device you’re using. Since a VPN’s purpose is, for one, to surf the internet using another IP address, or accessing content in different places, you’d think that the main feature of a VPN is to provide users with tons of servers. 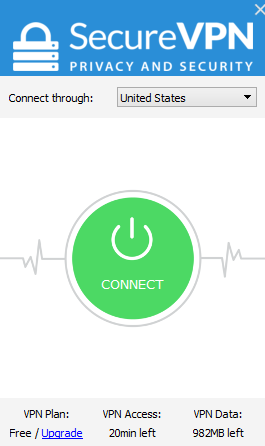 Seems like SecureVPN didn’t get the memo. As of October 2018, they only have five servers (yes, that’s not a typo, we really do mean 5) in five locations which are: United States, Netherlands, Singapore, Luxembourg, and India. Considering that they only have a handful of servers to choose from, our thought was “okay, surely they deliver insane speeds, right?” Wrong. Very, very wrong. 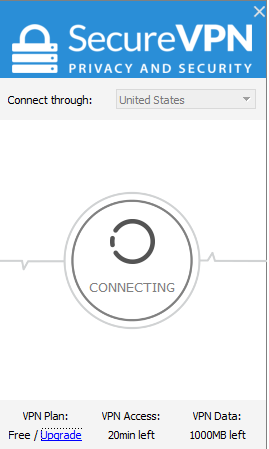 Hey SecureVPN, we’d like more speed, please. In fact, add this to our wishlist (start with more servers). Weirdly, SecureVPN doesn’t seem to have a refund policy. We went to their terms and conditions hoping that they just decided to explain their refund conditions there, but we were saddened by what we read. It turns out the lack of money-back guarantee isn’t a layout problem, but they really don’t offer users any refund. This is either unbelievable confidence in their product or a dubious way to keep hold of unhappy customer’s cash – either way, this is not great. In terms of payment, if you’re not a fan of PayPal then you can start looking for another VPN right now because SecureVPN only offers a PayPal payment option. No credit cards, no bitcoin, no money transfers, or other payment methods that most VPNs offer. This might be a tiny inconsistency but that’s a 20-dollar difference per year. As for devices, they support all major platforms like MacOS, iOS, Windows, and Android. Unlike our leading VPNs, SecureVPN doesn’t support any additional devices like routers, gaming consoles, or SmartTVs. After downloading the product and running it on your device, it’ll automatically sign you in. There aren’t any settings so you can’t configure anything on the app. The only thing you can do is connect. Sure, it’s easy to use, but way too simple for users looking to customize their experience. The last point to mention is that connecting seems to take an age – at least for us. 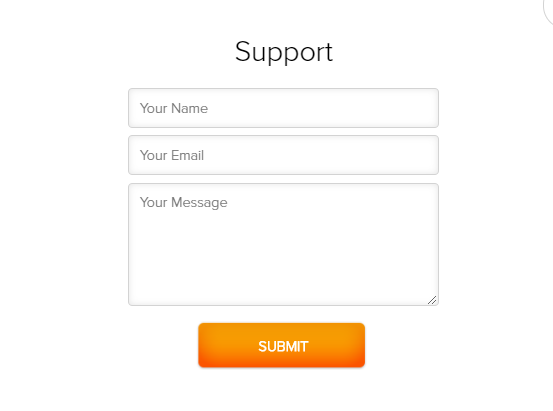 SecureVPN’s customer support is an email system you can find on their support page. You have to fill out their contact form with your name, email, and issue. When we tried sending ours, the page wouldn’t load. It said that SecureVPN isn’t sending any data (there’s a joke in here somewhere about privacy and great VPN protection, but we’re too lazy to make it). We did a little research and we found users claiming that their customer team takes almost 12 hours to respond to a simple concern; so even disregarding the network issues we were having, customer support seems less than stellar. In addition to this, at the bottom of the screen, you’ll see a support message that says the team is available 24 hours a day, 7 days a week. But when you go their FAQ page, the support availability is listed as 9AM-5PM EST. Now, we’re not math wizards so feel free to correct us here, but we’re pretty positive that 9-5 doesn’t equal 24 hours. SecureVPN doesn’t have a knowledge base page; they do have an FAQ page. When we checked it out, what we found was almost comical. Instead, it answers to two things: how to get a code and how to enter a code. What code are they referring to? Computer code? Hacker code? Code to the meaning of life? We love that the titles are “How to Android/iOS” – Maybe there’s a secret guide to being a mobile wizard in there? Like their customer support, documentation is sorely lacking. 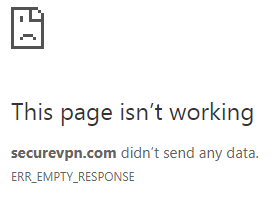 Unlike most VPNs that boasts having a zero-logging policy, SecureVPN doesn’t seem to have that text written anywhere on their website. Data collected includes users’ Name, Address, E-mail Address, Payment Data, User account, external IP and internal IP, social security number (joking, joking, but only about the social security number, the rest is real) and Clients who opt to use the optional control panel will receive a temporary cookie. That’s a whole lot of important information that could easily aid in tracking a user. IP and DNS Leak Test: LEAK ALERT! Upon reading other reviews about this product, we weren’t exactly confident in SecureVPN’s protection – and yep, we were right to be concerned. Leaks, leaks everywhere – it’s like a vegetable garden in here (leeks, get it? Nevermind…). SecureVPN is fairly new to the game. They entered the VPN scene back in June 2015, under SecureVPN Inc. There isn’t much to tell about SecureVPN. But as far as we can see from their website and business practices, they’re not a big company. They fall under the Five Eyes jurisdiction as their company is headquartered in the United States. If you’re not yet familiar, the Five Eyes jurisdiction (that’s now grown into Nine Eyes, and Fourteen Eyes) is a group of countries that collect and share data of internet users under their scope. Meaning a simple court order from the government addressed to your VPN provider would subject the company to give all the information they have of their users; and with SecureVPN, who we’ve established collect a whooole lot of information, you’re going to struggle here. This is why it’s important to be careful of your VPN’s jurisdiction and logging policy. So, is SecureVPN worth a buy? Our answer is a big, resounding nope. The amount of data they log (and considering their jurisdiction) is a huge nail in the coffin for recommending their service. Finding out that they have IP leaks is one more nail. The fact that they work with Netflix and torrent are great features, but are they worth putting your security at risk? No, not really – unless you are looking for a VPN solely to access Netflix in other countries. Top it off with terrible customer support, speeds that a turtle could beat, and you’ll find this VPN is not a product we’d recommend. Plus the price isn’t too attractive, either. If you really want to use a VPN to protect your data, check out our top VPN picks.